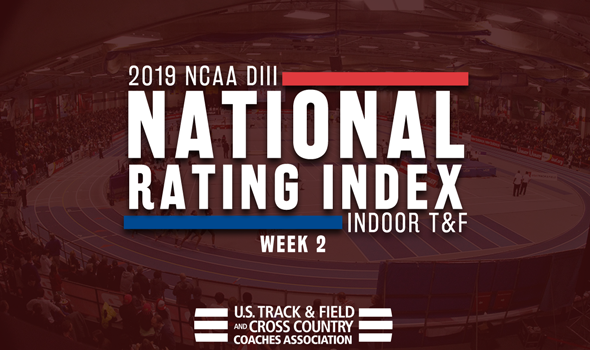 NEW ORLEANS – Minor changes to the NCAA Division III Men’s and Women’s Indoor Track & Field National Rating Index transpired between Week 1 and Week 2. The men’s top-5 saw a small shuffling of teams, while a familiar face took over the No. 1 spot of the women’s chart when both were released Tuesday by the U.S. Track & Field and Cross Country Coaches Association (USTFCCCA). Don’t forget that the 2019 NCAA Division III Indoor Track & Field Championships will be held March 9-10 in Boston at the Reggie Lewis Track and Athletic Center. Nothing is different about the top-2 teams here as North Central (Ill.) and UW-Oshkosh continue to hold down the No. 1 and No. 2 spots, respectively, for the second week in a row. Neither the Cardinals nor the Titans were affected by their own performances this past weekend. The same can’t be said for the No. 3 and No. 4 spots that were previously occupied by Mount Union and UW-Whitewater in Week 1. The Warhawks leapfrogged the Purple Raiders in Week 2, to no fault of the latter team. Over the course of the season, other performances shake up the National Rating Index and this is one of those occurrences. UW-La Crosse found its way back inside the top-5 for the first time this season after jumping two spots from Week 1. Seth Holden boosted the Eagles this past weekend with his effort in the 200 (21.78), which left him 12th in the TFRI Individual Rankings. The biggest jump in the top-25 this week belonged to Wesley, which soared from No. 29 to No. 17. Both Kai Cole and Thomas Kalieta Jr. clocked identical times of 21.74 in the 200 and moved up to ninth in the TFRI Individual Rankings. There is a new No. 1 team by the slimmest of margins. Washington (Mo.) ascended to the top spot for the first time since the 2017 season this week as it barely edged former No. 1 Williams. The Bears have 138.65 points, just 0.04 points more than the Ephs’ total of 138.61. Julia Dannenbaum and Eka Jose propelled WashU ahead of Williams. Jose is now ranked third in the TFRI Individual Rankings in the long jump with a mark of 5.78m (18-11¾), while Dannenbaum cleared 3.80m (12-5½) to take over fourth in the pole vault chart. Third-ranked Johns Hopkins solidified its spot thanks to the efforts of Caelyn Reilly this past weekend. Reilly ran quite well over 5000 meters, crossing the finish line in 16:53.45 (converted to 16:45.75 for seeding purposes) and is now ranked fifth according to the TFRI. MIT and UW-La Crosse remained at fourth and fifth, respectively. The biggest jumps in the top-25 belonged to Albion and Rochester (N.Y.). The former jumped 10 spots from No. 25 to No. 15, while the latter bounded eight spots from No. 24 to No. 16.